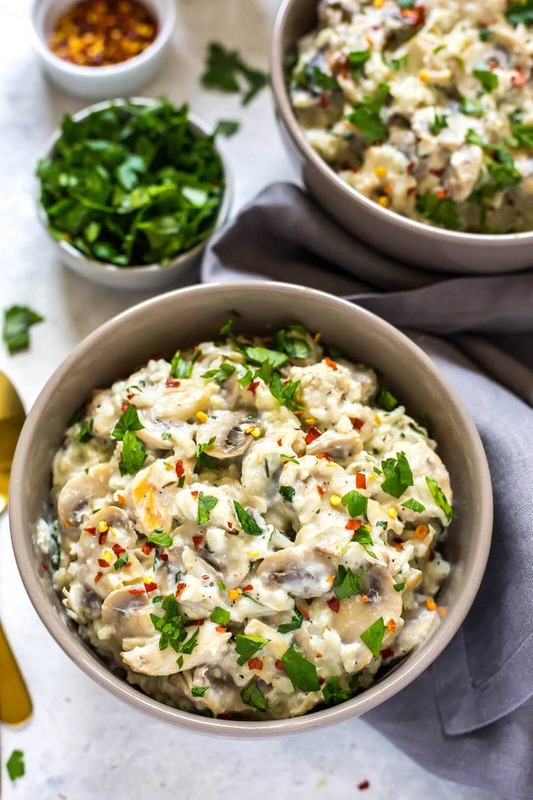 This Instant Pot Cream of Mushroom Chicken is a delicious, hearty weeknight dinner idea made healthier than the classic version of this dish – say hello to your childhood favourite casserole re-envisioned! I don't know about you, but when I was a kid, things like Hamburger Helper and casseroles (both rice and pasta) using condensed Campbell's soups were a big thing. I think this was probably the case in the late 80s and early 90s when I was growing up. I honestly don't even know why it was such a thing…though I can get behind a few shortcuts in the kitchen, using canned soup as a sauce almost seems like a bit of a waste when you can use much simpler ingredients that you probably already have lying around. I guess maybe this was supposed to be the healthier version of using jarred sauces. Anyway, when I was a kid my mom sometimes made this mushroom rice that I used to die for. 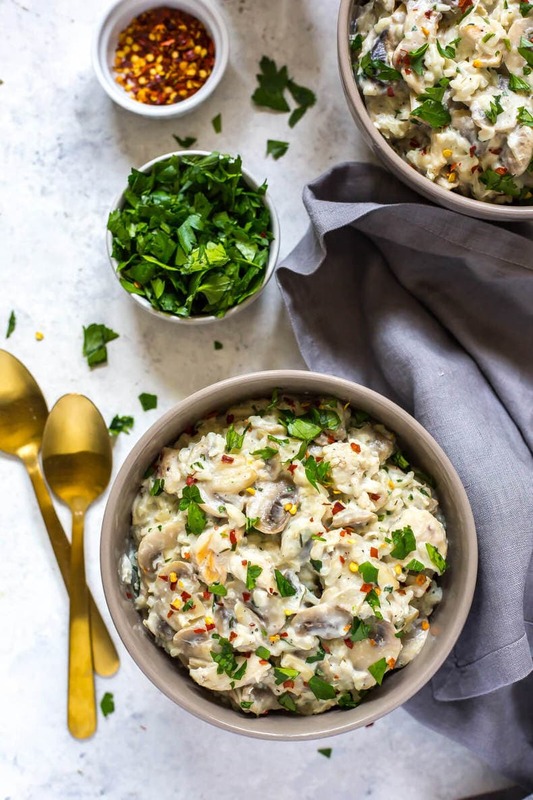 Partially because I'm obsessed with mushrooms, but also partially because it was just so creamy and really turned rice into something I could enjoy eating. To this day I'm not really a fan of rice on its own though I do value it as a staple in many dishes, especially Thai food and stir fries. But for me to like rice, you gotta dress it up. 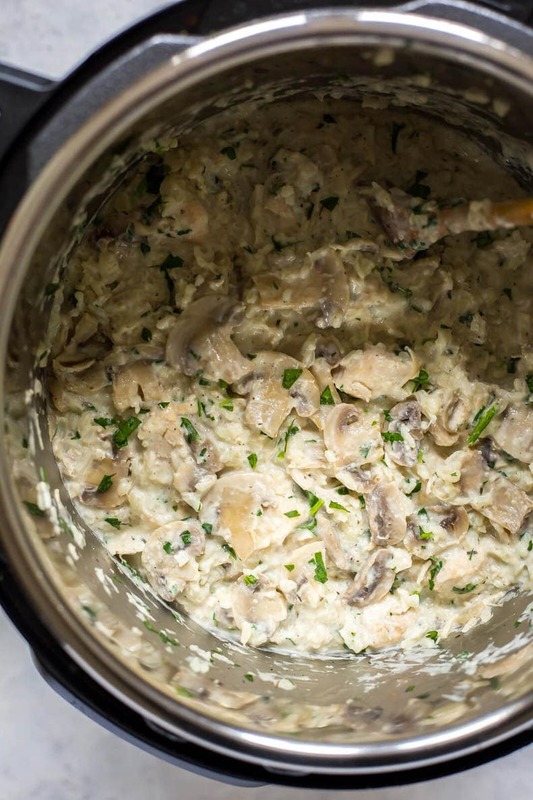 Cream of mushroom chicken to the rescue. At least I think she used to pair this mushroom rice with chicken. My childhood eating habits are a bit of a blur, but you get the point. 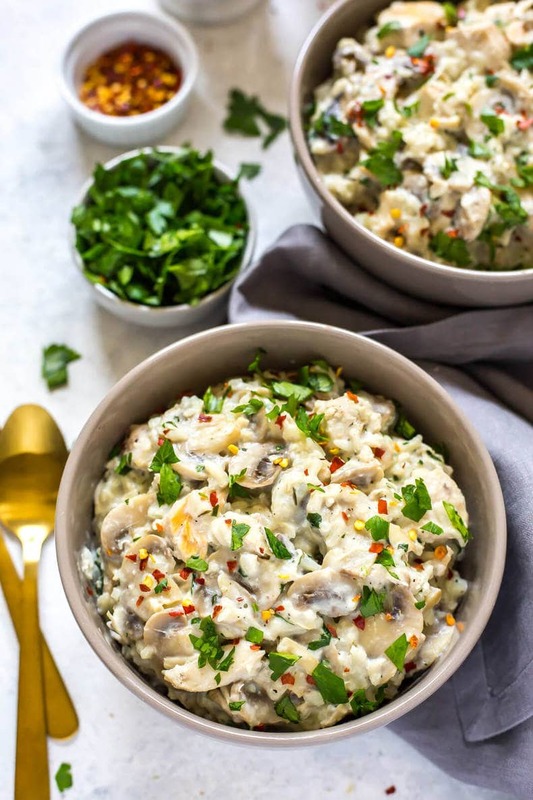 There's nothing better than a little bit of comfort food every once in a while, and that's where this cream of mushroom chicken and rice hits the spot! Now I've turned this into a more grown-up version without so many preservatives, and most of the ingredients are likely already on hand at home save for the mushrooms. 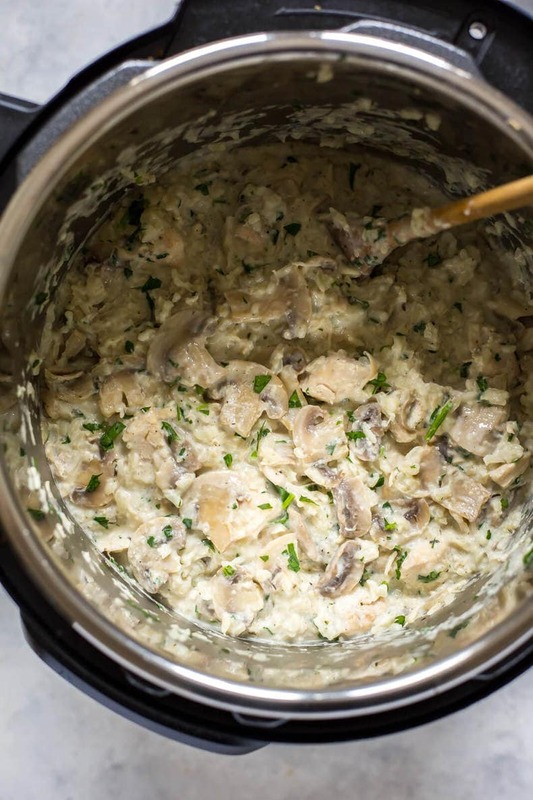 It's a surprisingly simple combo of mushrooms, garlic, onions, chicken, rice, chicken broth, sour cream and a pinch of thyme. 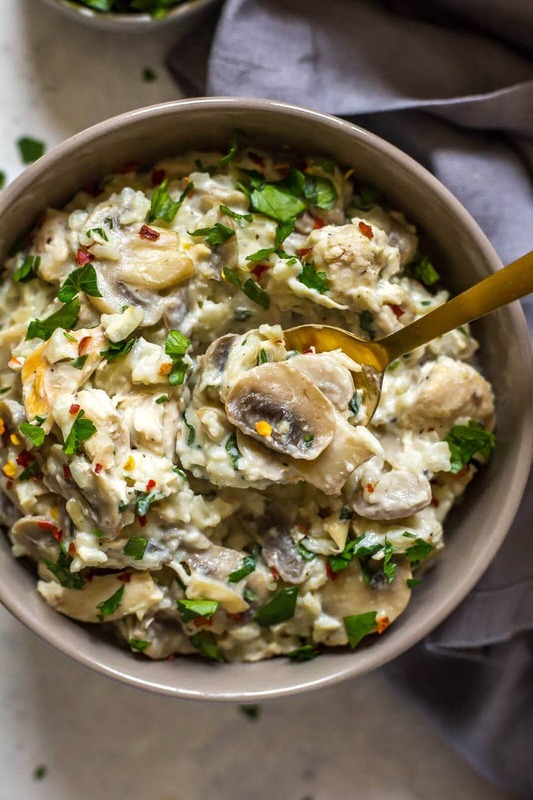 This cream of mushroom chicken is almost like a mix between a risotto and a casserole. And did I mention that you make it all in the Instant Pot? Oh yeah, this recipe's ready in 30 minutes or less, so it really is the reinvented weeknight dinner. Ready quick and in one pot! 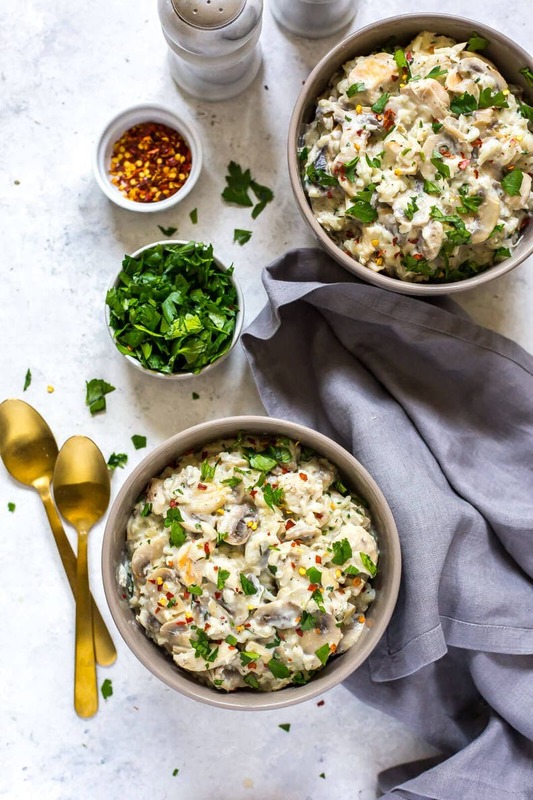 You just stir in the sour cream after you cook the chicken, mushrooms and rice and sprinkle a little parsley and red pepper flakes on top. Now that's an elevated version of a classic! 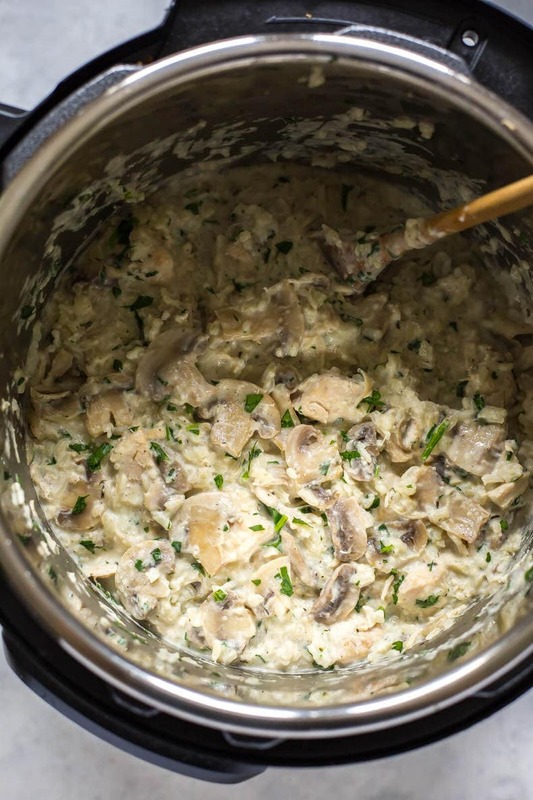 I also really love this cream of mushroom chicken because it's everything you need in a meal all in one. No having to make a salad to go with it, or prep the chicken separately. I swear, I could just cook EVERYTHING in my Instant Pot it's so easy! 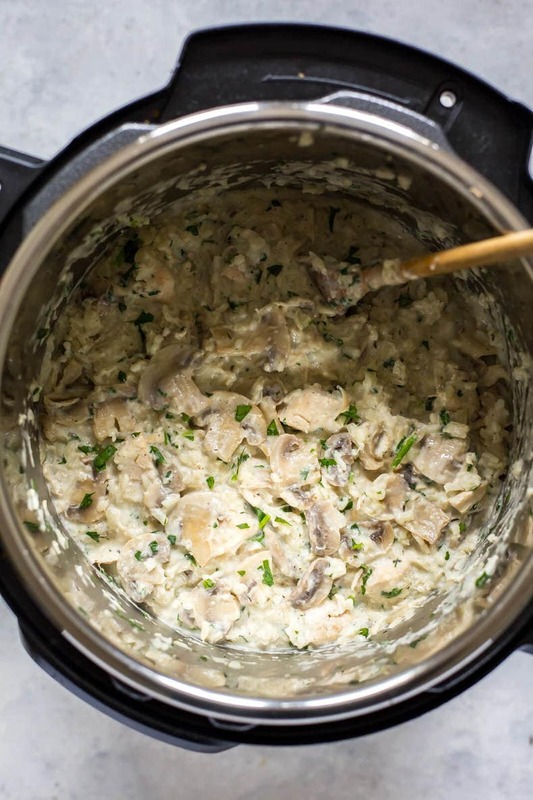 Will you be making this Instant Pot Cream of Mushroom Chicken? 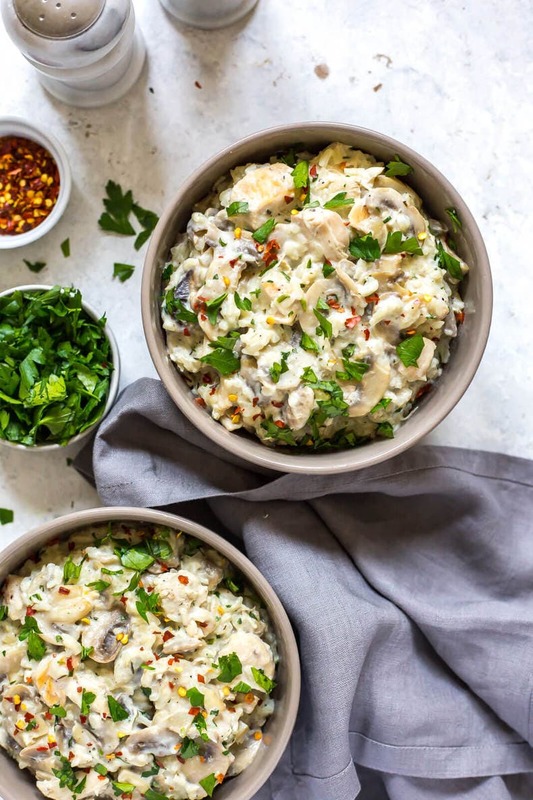 You're going to love this reinvented chicken and rice dish so much – and it's so perfect for fall and cozying up on the couch too! I get free range chicken from my monthly Butcher Box – it's a great way to enjoy healthier meats and poultry and they're even offering 2 free ribeyes and bacon! 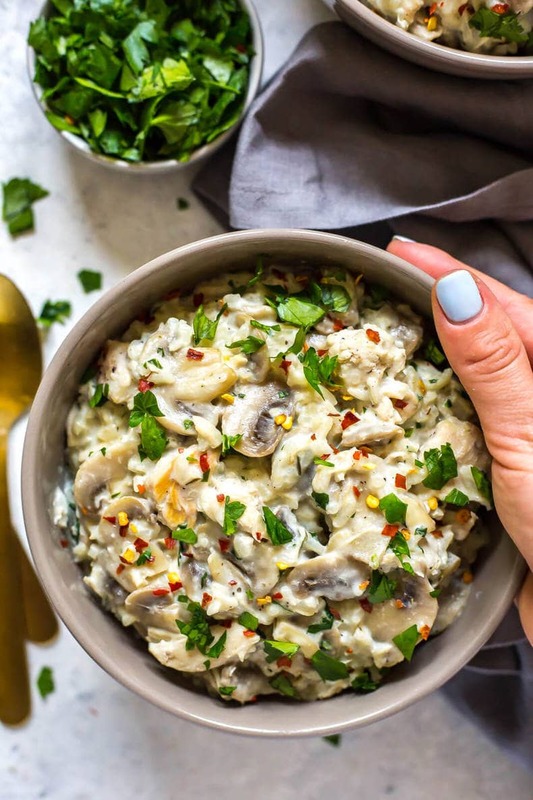 This Instant Pot Cream of Mushroom Chicken is a delicious, hearty weeknight dinner idea made healthier than the classic version of this dish - say hello to your childhood favourite casserole re-envisioned! Add olive oil, chicken, mushrooms, garlic, shallots, salt and pepper, chicken broth and rice to Instant Pot in that order. Cook on high pressure for 3 minutes, then allow a natural pressure release (about 15-20 minutes). Remove lid once pressure gauge has fallen, then stir in sour cream and parsley. Let sit a couple of minutes to thicken, then serve and enjoy! Just wondering is the rice precooked or uncooked. Hi, just wondering if this type of thing could be done without a pressure cooker?? Hi Cat – I’m sure it could but unfortunately I can’t give alternative directions. Sorry about that! Hi! I’m a bit confused and new to this; uncooked rice recipes say to cook rice 22~24 minutes with a natural pressure release of about 18 minutes…..how is it cooked in 3 mins? Hey Teresa…I’m not sure why there is such a discrepancy in the cook times on rice either. I’m wondering if it’s a different setting and different amounts of rice. In this recipe you’re only cooking up about 4 portions of rice. I’ve always done it this way (3-5 minutes on high pressure) and it always turns out beautifully. Any more and I fear things would get overcooked. I tried this, but the rice was crunchy and not really well cooked. Perhaps next time I should increase the cooking time to 5 minutes? Hmm that’s so strange, I’m sorry Brett! Wondering if it was the type of rice used? This was good. However, I would adjust a few things- I would season the chicken with salt and pepper before adding the other ingredients, and I would pour the chicken broth in after the rice to get it all moist. The rice is not cooked entirely. Should it be in the bottom with the liquid? The recipe smells fantastic! Hey there! Wondering what type of rice you used? Sometimes it’s just a matter of letting the rice sit more to absorb the liquid. Hoping we can troubleshoot further! I was using basmati rice for this, and letting it sit did the trick. Hi, Can I use Jasmine rice with this recipe? Hey Lana – you definitely can yes! Do I need to change the cooking time for Jasmine rice? I personally haven’t needed to change the cooking time, I sub in jasmine rice all the time in many of my Instant Pot recipes but I feel as though sometimes people have issues with liquid absorbing fully and I don’t know that it’s an issue related to cooking time per se. I think it depends on the brand of rice you use and unfortunately I’m not always able to troubleshoot exactly why. Usually letting it all sit an extra 5-10 minutes will allow for extra liquid absorption though and worst case scenario you can always put it on for another 2-3 minutes! Does the cooking time change if I changed the serving size to fit my family? And is Basmati rice ok to use? Hey Maja – you should be able to double the recipe and use basmati rice in place of jasmine! If doubling, add 2 more minutes to the cooking time. I will agree that the rice (used jasmine) on top is a bit undercooked. I will make this again but I think I’ll change the rice to be under the liquid next time. So happy you liked it Mark!!! Mushrooms release a lot of liquid so the undercooked rice on top could be as a result of that too. Thanks for the recipe, it came out perfect. I was bit afraid that the rice would not be done, but it was perfect. Hey Art – I’ve only tried it with traditional white rice though you could try the instant rice! So happy to hear, thanks for updating me!! Would you change cooking time if you double the recipe? Hey Kate – I haven’t tried doubling it so I’m not sure how that would impact cooking time. My gut tells me to add 2 minutes to the cooking time so you could try that but I can’t guarantee results just because I haven’t tried it myself. Hope that makes sense! I made this tonight with frozen chicken and brown rice. Did 4 minutes to make sure it all got done, and it was perfect! You don’t saute the chicken, shallots and mushrooms first? And how would halving the recipe affect things? Hey Kirk – I don’t find you need to saute anything first, the flavours are all still there just by pressure cooking. And unfortunately I couldn’t tell you how cutting it in half would impact the cook time. I believe it would still be the same but I haven’t tried it myself so couldn’t give you a guarantee. can you sub bowtie noodles instead of rice? if so will the cook time change? Hey Christopher – this is a significant change to this recipe and I haven’t done it myself. I wish I could provide alternative directions but I would have to test it myself first. Sorry about that! Hi Taylor, This recipe looks amazing and I’m planning on trying it out today. Have you made this with brown rice? I don’t usually purchas white rice and have none at home. Made this tonight, but it was a fail. My fault for sure, but still a fail. The question I have is that you say to let it NR, and then say 15 to 20 min. Are we supposed to wait until the pressure pin drops on its own, or do we go ahead and release the pressure after 20 min? I waited approx 45 min and found up releasing on my own and the food was pretty much disintegrated. Hey Heather – I’m sorry to hear this didn’t turn out for you. Waiting 45 minutes would definitely cause the rice to be very mushy. I usually wait until the pressure pin drops on its own, which takes about 15-20 minutes, but you could release what little pressure is left if it hasn’t dropped after 20 minutes (there would likely be little to no steam coming out). Sometimes I have to give my instant pot a tiny tap to get the pressure tab to drop. Sounds like yours might need the same! Hi, I was hoping to make this, but my local store is out of sour cream. I really don’t want to drive half an hour to the next nearest market. Is there something I could use to substitute for the sour cream? I’m not sure what else besides maybe 1/4 cup heavy cream would work as a substitute – wish I could be of further help! Do you rinse the rice first, especially if using jasmine or basmati??? Hey Pat – I don’t, I really find you don’t need to!